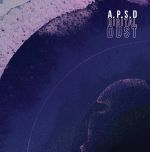 Review: Together Melbourne pair Amin Payne and Sean Deans form APSD, and they debut in quite impressive form with this Digital Dust album for Hot Shot Sounds. Inkswel and Benny Badge's label has developed into the prime source for what they call "drum machine soul music" and APSD are a perfect fit. Some 11 tracks deep, Digital Dust features contributions from the voice of Fat Freddy's Drop himself, Joe Dukie, as well as Miles Bonny, Cazeaux OSLO, Silent Jay and more. Yet it's Deans and Payne's innate mastery of a glistening brand of funk across various tempos which shines through on this album. Review: Montreal's KenLo Craqnuques has been bubbling away in the underground for some time, but lucky for us Hot Shot Sounds took notice and now present his first outing on vinyl with the Wheeels EP. There is an irresistible funk to the sounds that Craqnuques conjures up, pushing fat, Moog-esque basslines and low slung machine beats rolling at an easy tempo that hark back to the golden days of boogie and electro funk. "Mollusque" indicates how his is far from a throwback sound though - this is up to the minute instrumental RnB that recognises the true roots of the genre while looking to the future, and it sounds utterly fresh.